Dozens of athletes with Down syndrome converged on San Jose this past weekend for a chance to make their NFL dreams come true. 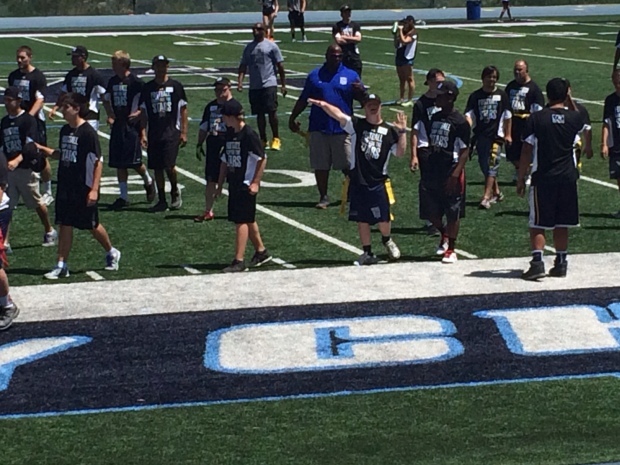 Eight years ago, Valley Christian coach Mike Machado created Football Camp for the Stars, a program that allows people with Down syndrome to experience football drills and even play in their own scrimmage. Current and former NFL players, including 49ers Joe Staley, Guy McIntyre and Dana Stubblefield, commit their time to help encourage the players. Stubblefield has been by Machado’s side since the program started. He believes it is important to not only get to know the players on the field, but to get to know them personally as well. Machado said the program itself was inspired by Valley Christian’s team manager, Andrew Watson, who has Down syndrome. Machado and Watson met when Machado was a special education teacher at Saratoga High School. Machado said he watched as other students ignored their classmates with disabilities. “There is a lack of education,” Machado said. Years later, Watson came to work for Machado and the Valley Christian football program. When Machado created Football Camp for the Stars, he said his goal was to provide Watson with the spotlight he and others deserved. “I wanted [Watson] to be the guy on the field getting cheered on,” Machado said. Stubblefield, who coaches at Valley Christian, served as one of the head coaches during Saturday’s scrimmages. Valley Christian’s varsity, junior varsity and freshmen players participate as well. He said he saw another side of his own players that doesn’t normally come out on the field. It is, Stubblefield said, a result of the relationships forged with the program’s participants. The Mariucci Foundation has also become involved. About three years ago, the family began donating the apparel worn at the event by both the athletes and the coaching staff. Steve Mariucci helps bring in NFL referees for the scrimmage and his son Stephen Mariucci is one of the coaches. It is a family event where everyone gets involved. Looking back on his experience at the camp, Jay MacIntyre, son of former SJSU Football coach Mike MacIntyre, said he enjoys coming back to his old high school and being a part of the program. He still remembers his most memorable experience. Valley Christian’s cheerleading squad roots on the players during the scrimmages. Girls with Down syndrome sometimes join the squad.